How much awesomeness is that, huh? I think this speech should be required viewing by all Liberals - we need to watch this once a month just to remind ourselves that we are not any of the ridiculous, hateful things that the Right Wing paint us as being. That we are so much better than how they see us. We need constant reminders that we should not be ashamed, but rather proud of the fact that we are Liberals. And that's why I made a t-shirt. Is creating a t-shirt a huge political publicity stunt? Nope. An earth shattering outcry against the Right Wing? No, Sir. Will this action forever alter the political landscape and, consequently, life as we know it in this country???? It's just a t-shirt. It's got some names on it - names of other liberals. 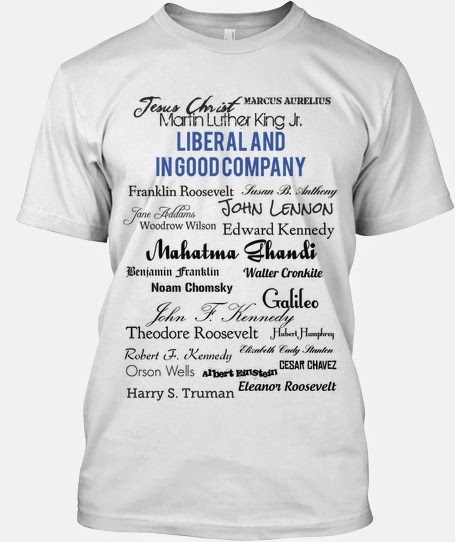 Liberals who have changed the world for the better. The Right Wing mercilessly tears at the word Liberal - it's a sneer and a punchline when they say it - but Galileo was a liberal. Ghandi was a liberal. John Lennon and Einstein and yes - despite the Tea Party rhetoric - Jesus Christ was a liberal. Here's a picture of the shirt - what I hope will be the first of the Daddy on the Edge line of clothing for fashion forward forward thinkers. If you click the pic, it will take you to the link http://teespring.com/LiberalT where you can purchase the shirt. This is a limited run - it's a test balloon, so we've set our goal at selling 25 shirts. There's also a limited time that you can purchase - we began a 25 day campaign last night, so we have 24 days to sell 25 shirts. Teespring, the company we're using, requires that you meet your sales goal before they print any shirts. If you don't meet the goal, anyone who's ordered the shirt will receive a refund. People that have tried to make this world a much better place, not just for a select few, but for all of us. I'd like for us to meet our sales goal, but more importantly, I'd like to spread this message. The Right Wing has been pounding their messages pretty hard over the last few years - I think it's time we stood up and reminded them of who we are, echoing the voices of those that came before us. "What do our opponents mean when they apply to us the word “Liberal”? If by liberal, they mean - as they want people to believe, someone who is soft in his policies abroad, who is against local government and who is unconcerned with the tax payers dollar, then the record of this party and its members demonstrates that we are not that kind of liberal. But if by a liberal they mean someone who looks ahead, and not behind; someone who welcomes new ideas without rigid reactions; someone who cares about the welfare of the people – their health, their housing, their schools, their jobs, their civil rights and their civil liberties; someone who believes that we can break through the stalemate and suspicions that grip us in our policies abroad – if that is what they mean by a liberal, then I’m proud to say that I’m a Liberal."